Using Photovoltaic (PV) panels to generate electricity for your home is a very smart choice. On the other-hand a secondhand solar panel is also a reasonably smart choice for residential alternative energy. It is cost efficient, inexpensive, better yet it can easily be purchased locally at a fair and reasonable price. Knowing how the market works, the costs, availability and the quality are key factors to obtaining your solar panel today. The best route to start is to contact local manufacturers or perhaps a company that specializes in solar power. It is not unreasonable to purchase used panels these days, as solar power consumers tend to exchange their used panels when they’ve decided to upgrade, to such things like solar roof tiles, and various other renewable energy placements and equipment. Generally, it is a wise decision to contact different solar based companies to discover whether or not they sell used panels, as well as if they have any used panels up for grabs and ready to be sold. Those specializing in solar energy equipment are extremely helpful and will, in most cases assist consumers interested in solar energy, used or not, therefore it is a good idea to ask for assistance if you’re not sure what you’re looking for, or have other questions. Informing said solar energy specialist what you plan on using your panel with is almost a mandatory task, this will allow them to pick out the right product for what you need done. 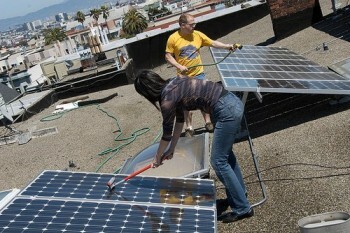 Of course before all this, you’d need to actually locate a solar energy professional. There are many ways to go about this, i.e. newspapers, magazines, as well as websites, such as Craigslist. There is a chance of obtaining free recyclable panels, it would require some time, patient and attentiveness in hunting for said item. The reasoning behind why free panels exist is simple, most companies, or persons have little problem with giving away for free in order to clear out space in a warehouse, or just out of their garage. At worst, you could still get panels for a fraction of their original cost. Unfortunately, attentiveness is required, you have to keep your eyes out and spend some portion of time hunting these deals down. There are some things you need to check when you do manage to get a hold of your Photovoltaic (PV) panel. When you are able to find a secondhand solar panel, you must observe a few things to discern whether or not it will be of any use to you, or not, in some cases. Examine the energy yield of the panel by using a multi-meter in sunlight. You’ll also have to ascertain the age of the panel in order to make sure it’ll last as long as you’d need it to. On the other-hand, even if a panel is old, it can still work perfectly fine assuming it was well-maintained. Still, despite this, examine the panel for such things as burn markings as well as cracks in the glass because these are sure signs of a faulty panel that cannot be repaired easily. Now, in a case where you’re not able to inspect the panel in person, ask the seller for some photographs of the panel, preferably in conjunction with a multi-meter so you’re able to ascertain the energy yield of the panel. It wouldn’t be a good thing to receive a panel that doesn’t work after all. A cost-effective means of energy could be yours, for an ample price, or even free. When switching to solar energy, make sure to do your research and hunt around a little and you’ll surely be able to go green and still have some green left in your wallet afterwards. Do you need more tips and suggestion of how to build your own home solar panel for less than $150? If you do, check out the Power4home system by John Russel. Read the Power4Home review on this blog for more information.